Recent advances in neuroscience have enhanced our ability to understand the inner awareness that leaders often neglect. Have you considered how potentially empowering it is to equip leaders from the inside out to make wise decisions and more effectively influence and collaborate with others? We believe that the most powerful resource is that aspect of attention we call the Wise Advocate, which represents our approach to the practical application of mindfulness in the workplace. The Wise Advocate is the voice within, the mind-oriented, dispassionate perspective of a clear-minded observer, helping you see yourself and your actions as others might see them. This inner voice may not be obvious to everyone, but it is always there. How do we develop the capacity to tune into the Wise Advocate? The interaction between mind and brain is central to the Wise Advocate hypothesis. The mind is active in a way that the brain is not. You can choose where to focus your attention, and your choices, made in the mind, will eventually affect the physical makeup of your brain. This phenomenon is called self-directed neuroplasticity. If you’re making a deal or thinking about satisfying your needs or those of others, you’re probably on the Low Road. This pattern of mental activity involves desire, expedience, immediate value, rapid problem-solving and the need for relief. It’s a familiar path and has real relevance, especially in business. The other path is the High Road. When you reflect on your deepest long-term goals and how to achieve them, or when you ask and reflect on what people are thinking and what they’re likely to do, it triggers the High Road. When you take the High Road, you are listening to your inner voice, your Wise Advocate. Recent research using brain imaging has demonstrated an important distinction between two brain areas in the upper and lower parts of the prefrontal cortex. The Low Road pattern of mental activity uses a functional center of the brain we term the Reactive Self-Referencing Center. This function is activated by questions like “What do I want, and what do others want?” “What’s in it for me, and what’s in it for them?” These kinds of tactical questions are described by neuroscientists using the term subjective valuation: Is it valuable, and is it relevant? These questions are typical of Low-Road thinking. 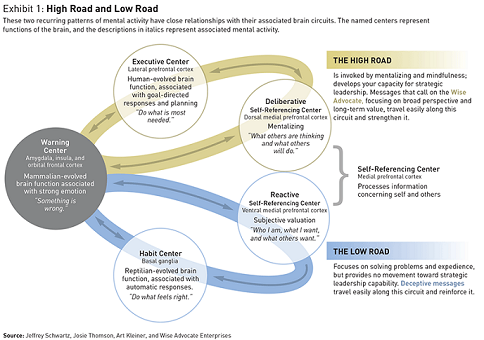 Exhibit One: High Road and Low Road reprinted with permission from “The Neuroscience of Strategic Leadership” by Jeffrey Schwartz, Josie Thomson and Art Kleiner from strategy+business, published by certain member firms of the PwC network. © 2016 PwC. All rights reserved. PwC refers to the PwC network and/or one or more of its member firms, each of which is a separate legal entity. Please see www.pwc.com/structure for further details. No reproduction is permitted in whole or part without written permission of PwC. “strategy+business” is a trademark of PwC. The High Road pattern of mental activity uses a functional center of the brain we term the Deliberative Self-Referencing Center. This function is activated by questions like “What are others thinking, and what will others do?” These kinds of strategic questions are described by neuroscientists using the term mentalizing: What is he/she thinking, and what will he/she do? These questions are typical of High-Road thinking. The essence of High-Road thinking is to consult the Wise Advocate and apply these reflections to yourself. For example: What am I thinking? What will I do next? What are my medium- and long-term goals? One practical way for leaders to discover their own Wise Advocate is by learning to use the Deliberative Self-Referencing Center, which is activated by reflecting on what others are thinking and what future actions they might perform and applying that reasoning to themselves. This kind of mental activity is also profoundly associated with what is classically known as mindfulness (i.e., What am I thinking, what am I paying attention to, and am I attending to my Wise Advocate?) Mindfulness is a clear-minded outer perspective on your inner experience, sometimes described as a third-person perspective on a first-person experience. During stressful times, leaders must pay attention to their emotional states, because those states will directly impact their capacity to focus their attention and make wise decisions. Why is this important for strategic leadership development? Cultivating mindful awareness by consulting their Wise Advocate will place leaders on the High Road. Unless they apply effort, their brains will automatically push them toward the reactive responses of the Low Road, because the Low Road is largely controlled by the habit center. The habit center directs behavior in automatic ways that we are generally not consciously aware of, significantly constricting our capacity for adaptive strategic leadership, creativity and innovative practices. When leaders focus their attention on the High Road of their minds, they will continually strengthen their associated executive brain circuits, giving rise to goal-directed responses and strategic planning. These circuits also play a key role in inhibitory control and self-regulation – the keys to delaying habitual behaviors and creating the capacity for truly strategic thinking and sophistication in leading others. Over time, this practice will gives them a greater facility for wise leadership, the kind of leadership that allows people to navigate large organizations with a Wise Advocate frame of mind toward seemingly impossible goals. Recent advances in neuroscience have enhanced our ability to understand the inner awareness that leaders often neglect. Josie Thomson and Jeffrey M. Schwartz, M.D. Josie Thomson is an independent, multi-award winning leadership coach based in Brisbane, Australia. A two-time cancer survivor, she has worked closely with Dr. Jeffrey M. Schwartz and developed a leadership coaching practice based on neuroscience principles. Email her at josie@josiethomson.com. Jeffrey M. Schwartz, M.D., is a research psychiatrist with a long interest in the role of attention in shaping brain function. He has been involved in the executive leadership field for over 10 years. Josie Thomson and Jeffrey Schwartz’s book will be published by Columbia University Press in 2017, and licensed trainings will be available soon.